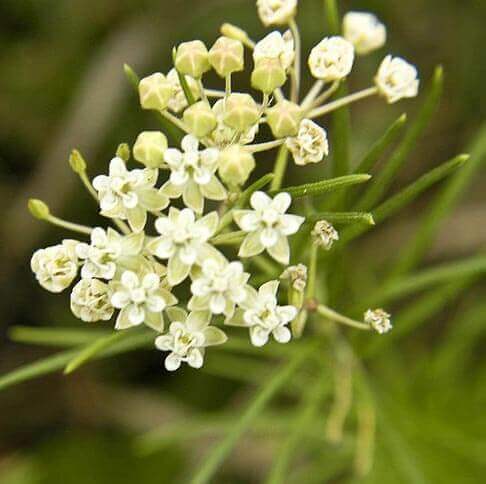 Asclepias, the milkweeds, is a genus of herbaceous perennial, dicotyledonous plants that contains over 140 known species. Milkweed is named for its milky juice, which contains alkaloids, latex, and several other complex compounds including cardenolides. Carl Linnaeus named the genus after Asclepius, the Greek god of healing, because of the many folk-medicinal uses for the milkweed plants. Dainty white jasmine like heads in Spring, followed by bladders resembling swans carried on the plant in Summer and Autumn; hence this plants common name. Plant grows to 2mt height with a spread on 1mt. Plant is best cut back in Winter/Spring to ensure compact growth. Requires full-sun and well-drained soil. Excellent as cut foliage.